From Almanac to Zig-Zag Fence, this delightful ABC book also serves as an introduction to many of the objects that filled the early colonial landscape. With a focus on things that are ours--as opposed to items brought over from England or Europe- - this book will serve as a fun and engaging way to study American history. Each double-page spread focuses on a single letter, with multiple illustrations and historical notes that explain what objects were used for. Discover what a Shaker Apple Drier is, the difference between American and European Axes, what ell-rules were used for, where the first lightening rod was installed, and much more. 64 pages, softcover. From Almanack, Bathtub, and Conestoga Wagon to X-Brace, Yankee, and Zig-Zag Fence, this sketchbook of antiquities revisits delightful words and inventions of old-time America. Artist and historian Eric Sloane presents a wondrous collection of American innovations, including hex signs, ear trumpets, popcorn, and rocking chairs. Readers of all ages will delight in these illustrated and hand-lettered pages, which feature brief captions explaining the items' origins and uses. Gadgets, gizmos, and contraptions include foot stoves, used in churches and under the blankets of sleighs and stagecoaches, oil lamps fed by whale oil and kerosene, water-wheels, weathervanes, and windmills (first built in Virginia in 1621 — a century later, there were nearly 1,000). The craftsmanship of the nation's early builders and inventors is reflected in this finely wrought compilation of historical curiosities. 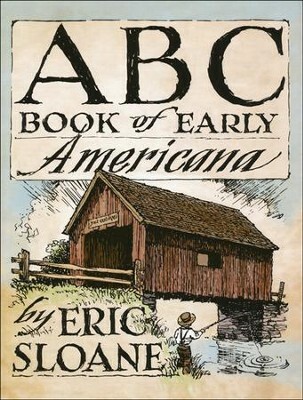 The books of Eric Sloane celebrate the time-honored traditions of early America and remind us of the ties that forever bind us to them. A prolific artist, Sloane created nearly 15,000 paintings and drawings over his lifetime, many of which enhance his delightful books of bygone days. I'm the author/artist and I want to review ABC Book of Early Americana.